This is a small project I worked on before Christmas. The Trusted Firmware-A is a reference implementation of a secure firmware for ARMv8-A CPUs. It has ports to both AArch64 (64-bit Arm Instruction Set Architecture) and AArch32 (32-bit Arm ISA). AArch32 is almost the same as ARMv7-A, for backwards compatibility. The SoC of the Raspberry Pi 3 is the Broadcom BCM2937, which has 4 Cortex-A53 cores. The Cortex-A53 is a microarchitecture that implements the ARMv8-A ISA with both 64 and 32-bit modes, so it is possible to port the Trusted Firmware-A. At work I'm one of the engineers working on the Trusted Firmware-A, and I really like the Raspberry Pi, so I simply couldn't resist, I needed to have the Trusted Firmware running on it. Even though the Trusted Firmware has ports to both AArch64 and AArch32, the one that interests me is AArch64. There is no real advantage for making the port for Raspberry Pi run in AArch32 mode. The firmware runs in EL3, the highest privilege execution level. The architecture allows to downgrade from 64 to 32-bit when reducing the privilege level, but not to increase it. That means that, for example, if the firmware is running in 64-bit mode, it is possible to have a 64 or a 32-bit hypervisor in EL2. Similarly, an operating system in 64-bit mode in EL1 can execute both 64 and 32-bit user applications in EL0. In short, a 64-bit firmware allows any other privilege level to use 64 or 32-bit mode, but a 32-bit firmware would restrict them to execute in 32-bit mode. Also, it is important that this port works with Raspbian. It is the Linux distribution for the Raspberry Pi with the best support, as it has the support of the Raspberry Pi Foundation itself. If a port of the Trusted Firmware is to be done, it's a good idea to make it work with Raspbian. This port is based on the work of Ard Biesheuvel (@ardbiesheuvel), explained in this article. The port is in this repository. The port has been heavily modified. For starters, that port didn't manage to boot Linux or to release the secondary CPUs from their wait loop (the RAM used as a mailbox wasn't initialized to 0 before entering the wait loop). Important note: Even though the Trusted Firmware-A is a reference of a secure boot flow, the Raspberry Pi 3 doesn't isn't a secure platform. The memory available to the CPUs is the DRAM, which can be accessed when the CPU is in Non-secure and Secure modes. However, in order to emulate the normal bootflow, the memory map is divided in a few regions. In short, this is a port that can be used to play around with, implement standard services that the OS can use, etc. This is not meant to be used to implement secure services in any way. It could be possible to emulate secure RAM by using the hypervisor translation tables to hide some memory from the OS, which would act as SRAM. This is non-trivial, and it is outside of the scope of this project. First of all, I connected a UART to USB cable to the Mini UART located in the pin header. I verified that the connection was working by using screen to connect to Linux through it. To enable this connection, the file config.txt on the root of the SD card must contain a line that says enable_uart=1. Also, I added console=serial0,115200 console=tty1 to the file cmdline.txt. Once I verified that it was working, I started to take a look at the code of the port. The port was quite old by the time I started to work on this project, so the first thing that I did was to rebase the branch, replace some old APIs and libraries by the new ones, and made sure that it compiled. I also enabled some CPU errata workarounds that can affect the Cortex-A53. Then, I had to figure out how to make it run. I needed to get all CPU cores running the same binary at EL3 in AArch64 mode. In short, the kernel has to be renamed to kernel8.img and the firmware has to be packaged as one single binary and named armstub8.bin. Then, in the config.txt file I added the following lines to tell the loader where to load the files in DRAM. One good thing about this unusual bootflow is that it is literally impossible to brick the Raspberry Pi, you just need to write the correct files to your SD card and it will boot again. Also, it gives the user a lot of flexibility on how to boot the Arm cores. Normally it's not that simple to select AArch64 or AArch32 at the highest Execution Level, that's fixed by the platform. In the Raspberry Pi, that can be changed by changing a value in the configuration file. This demo by Stephen Warren was useful to test that my code was running in the conditions I needed. That demo shows the same message per each CPU with the values of some registers, like CurrentEL, that shows the EL in which the code is running. The exception level is encoded in bits 3 and 2 of register CurrentEL, which means that this code is running at EL2, as we want! As you can see, the demo only prints the registers of one CPU. This is normal, as all secondary cores are supposed to wait for the OS to power them ON (or, in this case, release them from a wait loop). The next step was to actually get the Linux kernel booting. The Linux kernel image simply replaces the demo I was using as BL33 image. I didn't have a 64-bit kernel to test with, though, just a 32-bit one (the one that comes with Raspbian). According to the Linux boot documentation for the Arm 32-bit kernel (located in Documentation/arm/Booting in the Linux kernel tree), it likes to start in Hypervisor mode. I just needed to tweak the final step of the firmware (the jump to the BL33 entrypoint) so that it jumped to this mode instead of EL2 in AArch64 mode. This is easy, it is only needed to modify the value of SPSR at the time it jumps to BL33. With the correct value, it jumps to the entrypoint in AArch32 in hypervisor mode. I didn't want to close the door to a 64-bit kernel, so I just created a build option, RPI3_BL33_IN_AARCH32, that would let the developer choose EL2 in AArch64 or Hypervisor in AArch32. The secondary cores couldn't come online because this kernel doesn't know about PSCI, which is the standard way of powering on Arm cores. But that's not a problem, there is a workaround, the kernel also has support for booting secondary cores by making them wait in a wait loop. The port I used as a base already had an implementation of the SMC (System Monitor Call) PSCI_CPU_ON that made the secondary cores wait in a loop until it was called, at which point it released them and jumped to the given address. armstub7.S is used by the Raspberry Pi 2, which has 4 Cortex-A7, but also by the Raspberry Pi 3 when booting a 32-bit kernel, and it has 4 Cortex-A53. 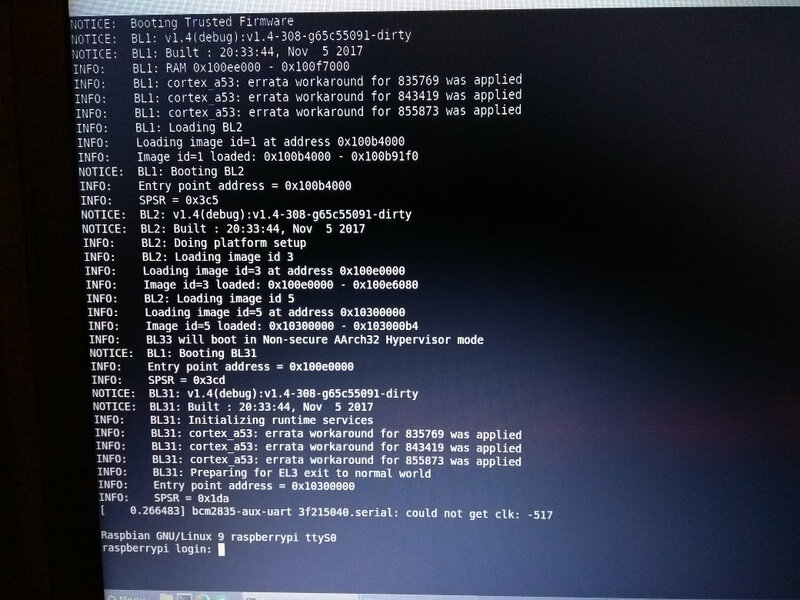 armstub8.S is used by the Raspberry Pi 3 when booting a 64-bit kernel. The compiled bootstraps are embedded on one of the elf files that are loaded by the VideoCore at boot. During this copy, the code of my waitloop was being overwritten. I checked that moving the firmware to a location far away fixed the problem, but now I really needed to find a way to protect he memory region used by the firmware. The whole point of BL31 is to have some services that can be used by the operating system. If Linux is free to use the memory used by the firmware, this can't work. I eventually found out the solution: To add memmap=256M$16M to the file cmdline.txt. This option tells the kernel that at the address 256 MiB there are 16 MiB that it shouldn't use, even if that range of memory contains valid ram specified in the device tree that tells it about all the hardware in the system. At last, everything was working! Linux could detect all 4 cores! All I needed to do now is to make sure that my port would also work with a 64-bit kernel, but... well, I didn't have any 64-bit kernel and I didn't know where to get one from. I ended up compiling my own. Then, copy the kernel image and the device tree to the SD card. Finally, install the kernel modules. I also had to create a bootstrap in a similar way as I did for the 32-bit kernel. It was easier now, though. All the booting information is in the file Documentation/arm64/booting.txt, like with the 32-bit kernel. [    0.033857] SMP: Total of 4 processors activated. It was reviewed and merged, and now the Trusted Firmware-A has an upstream port for the Raspberry Pi 3! It was a pretty interesting project, I learned a lot about the Linux kernel boot process and about the kind of problems that people that do the bringup of a platform have to face. As of 2018-03-23, the name of the project is Trusted Firmware-A. All references to Arm Trusted Firmware have been replaced by the new name.